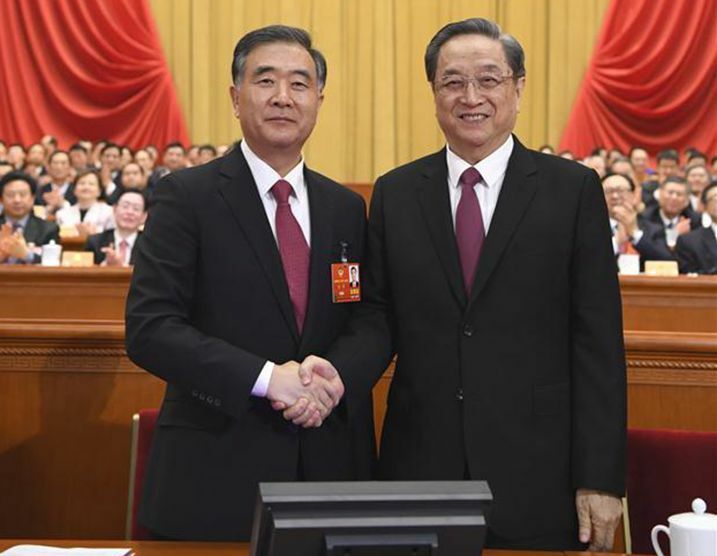 Wang Yang was elected Chairman of the National Committee of the Chinese People's Political Consultative Conference (CPPCC), the top political advisory body, on the afternoon of March 14. Wang was elected at the fourth plenary meeting of the first session of the 13th CPPCC National Committee by more than 2,100 political advisors. Yu Zhengsheng, Chairman of the 12th CPPCC National Committee, shook hands with Wang amid warm applause after the election result was announced. Wang was born in March 1955 in Suzhou of east China's Anhui Province. He began his first job in June 1972 and joined the Communist Party of China (CPC) in August 1975. He received a university education at the Central Party School, and holds a Master of Engineering degree. Wang had worked as worker, teacher and Party and government officials in Anhui until 1999, and later held Party and government posts in central and local organs, such as Party chiefs of Chongqing Municipality and Guangdong Province, and deputy secretary-general of State Council. He has been Vice Premier of the State Council since 2013. At the first plenary session of the 19th CPC Central Committee last October, Wang was elected member of the Standing Committee of the Political Bureau of the CPC Central Committee. Altogether 24 vice chairpersons and 300 Standing Committee members were also elected at the plenary meeting on March 14. Xia Baolong was elected secretary-general of the CPPCC National Committee. The newly elected Chairman and vice chairpersons are aged 64 on average. Among the vice chairpersons, 11 are CPC members. Four are from ethnic minority groups and two are women. The Standing Committee members are aged 59.3 on average, 65 percent of whom are not CPC members. A total of 33 Standing Committee members are from ethnic minority groups, and 39 are women. On the morning of March 14, the session's presidium adopted a draft resolution on the work report of the Standing Committee of the 12th CPPCC National Committee, a draft resolution on an amendment to the CPPCC charter, a draft report on the examination of proposals, and a draft political resolution on the first session of 13th CPPCC National Committee. It was decided that all the drafts would be submitted to the closing meeting on March 15 for approval. The CPPCC is an important organ for multiparty cooperation and political consultation led by the CPC. Its annual session this year, which opened on March 3, will conclude on March 15.